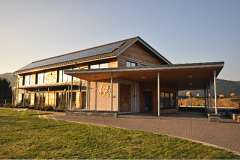 as PDF Canolfan Hyddgen - built in 2008 & occupied in January 2009 - is the UKs 1st certified Passivhaus office building located in Machynlleth, Wales. As a BREEAM excellent Multi-occupancy building with over 15 tenants it provides Bi lingual IT provision for the adjacent school, night classes, adult learning, meeting rooms, drop-in centre and council service point. JPW led the design team and partnered with the Client to satisfy a brief which demanded a building which could maximise revenue through flexible/continous use and minimise running costs via energy efficiency to create a environmentally & financially sustainable facility. Consultation with stakeholders at the earliest opportunity embedded a passivhaus approach into a design focused on local natural aesthetics & materials. On going monitoring, regular servicing and induction of building users has enabled continual reduction of energy consumption below predicted for the last 4 years.